I hope you are well. As promised here is a bio of my trip to Taiji. If you have any questions you would like answered please send them to me. More than happy to be interviewed for your blog. Nothing can prepare you for the surreal nightmare that is The Cove. Until you experience what is happening here you cannot fully grasp the strength and passion required to be a voice and stand strong here for months at a time. I have spent just under 2 weeks as a CG and it is emotionally and physically draining. I have the up-most respect for our Team Leader, Melissa Sehgal and Assistants for the work they do, without your dedication our presence at the Cove the world wouldn’t know what is happening..
life. 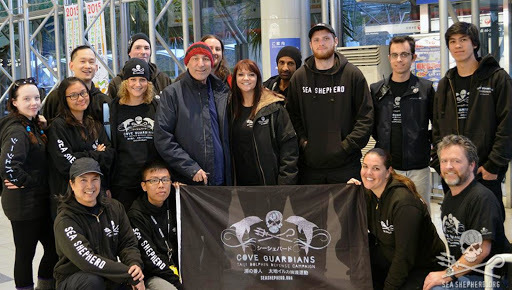 I have been blessed to have been a Cove Guardian while my hero Sam Simon the "super human" has been a special guest. What an honour to be in the presence of such a strong, selfless and passionate soul! I was also fortunate enough to see the last day of the season, I watched the boats come in for the last time of the season (empty handed) and witnessed the pack up process. From a young age I have felt a deep connection with all animals great and small. 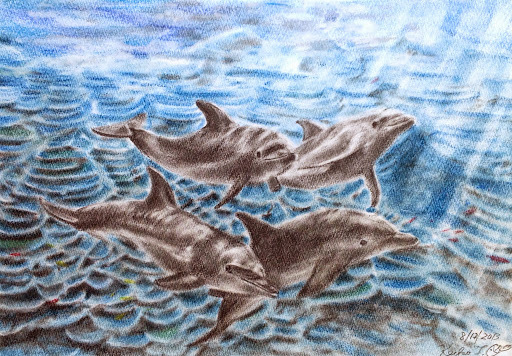 Dolphins in my opinion are of a higher intelligence than humans, we cannot even comprehend just how intelligent and sentient they are as they have an entirely separate part of the brain that we humans do not fully understand. What is being done here is not tradition, it is absolutely barbaric and soul-destroying. It is difficult to comprehend that a town that seems to love dolphins can justify the brutal, barbaric slaughter that happens here on a regular basis. I don't understand how a person can go to a dolphin show and eat dolphin meat at the same time. 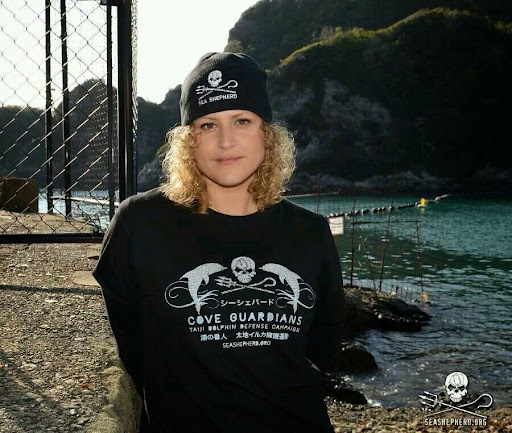 I have been following SS Cove Guardians for a while now, I forced myself to watch the documentary, The Cove, the evening before I attended the protest for the beginning of the 2013/2014 Hunting Season and within a few months I applied to be a CG and booked my trip. The anxiety that you feel when all banger boats leave the harbor is nothing short of gut wrenching! You feel dread when the skies are clear and actually pray for rain every day! Even on Blue Cove Days it is still heartbreaking as the banger boats pass some of the many pens with captive dolphins in them. The same boats that destroyed the families of the imprisoned dolphins. I have read many negative comments towards Japan which is ignorant and unfair as my experience with the Japanese people has been pleasant, they are incredibly helpful, honest and lovely. This is a small group of killers that do not even reside in Taiji, this hunt is driven by ego and greed. People also assume that Sea Shepherd are aggressive, this is also not accurate. We basically followed all the Japanese laws and even the separate rules that apply only to Sea Shepherd Volunteers. Our team leader has always conducted herself in a professional manner when dealing with the overwhelming police presence, which would not be easy. Our every move has been followed and monitored. Never be silent. Never give up! don't buy a ticket to a show! In Taiji Japan, the people have claimed to eat dolphin meat since way back. A woman from Taiji responded to the reporter, "We have eaten dolphin meat for a long time! Please go away!" It is okay if the village people themselves to eat the meat, but even at that, they are killing too many of them. They claim that dolphins are pests, and it is necessary to kill them in order to retain the abundance of fish to fishermen. To me, I think the fish are thinking about that to humans. The less humans, the more food for them. Sea life belongs only to the sea and not to humans. It is necessary to have permission from the sea life to share their resources. We don't need to force them to share their food to the extend of over killing marine life. The Taiji people do not only farm for their own dolphin meat to eat, but they sell the meat online as 'dolphin jerky' for profit to all over the world. 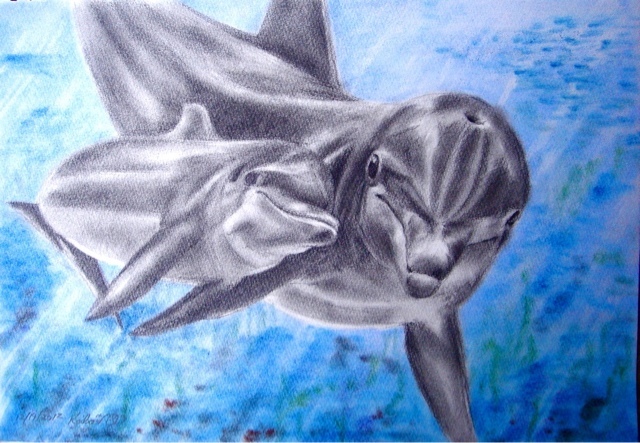 Therefore, their main purpose of killing dolphins is to obtain as much money as possible. 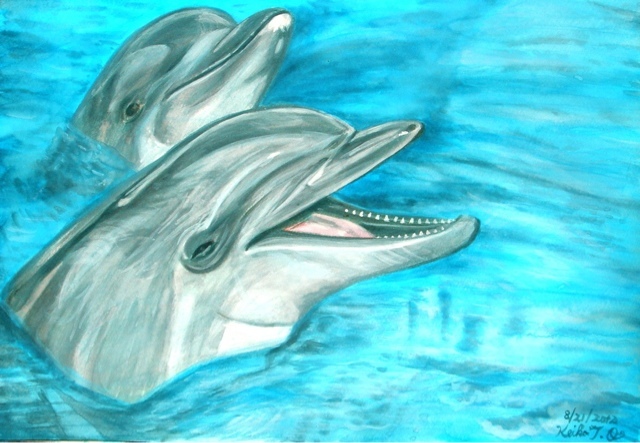 Their traditional ways were good long time ago, but now they are killing dolphins too much. Please stop killing dolphins. There is always other food to consume than dolphins. ◆Cancel plans to build a Dolphin Zoo in Taiji . ◆WAZA: $TOP $UPPORTING TAIJI'$ DOLPHIN $LAUGHTER AND EXPEL THE TAIJI WHALE MUSEUM IMMEDIATELY !! ◆Stop the Dolphin Slaughter in Taiji, Japan!!! ◆Yahoo: Stoppt den Verkauf von Delfin- und Walfleisch !!! ◆Yahoo: Stoppt den Verkauf von Delfin- und Walfleisch !!! Stop the sale dolphin and whale meat on yahoo! ◆Captivity is cruel - don't go to a show! ◆All dolphinaria must be closed in Europe ! ◆The dolphin hunters of Taiji, Japan: Stop the slaughter and capture of wild dolphins in Taiji, Japan. ◆coca-cola: Stop supporting International Marine Animal Trainers Association (IMATA). ◆IMATA TRAINERS: DON'T TRAIN TAIJI DOLPHINS! ◆BBC - Take a Crew to Taiji! Japanese fishermen rounded up more than 250 bottlenose dolphins in a secluded cove to kill for meat or sell into a lifetime of captivity, U.S. conservationists warned. The annual hunting of dolphins at Taiji Cove highlights the rift between conservationists worldwide who see it as a bloody slaughter and Japanese who defend it as a local custom. The Sea Shepherd Conservation Society first raised the alarm over the plight of the dolphins Friday, saying five separate pods of bottlenose dolphins had been "driven into Taiji's infamous killing cove." The group warned that the dolphins would "face a violent and stressful captive selection process. Babies and mothers will be torn from each other's sides as some are taken for captivity, some are killed, and others are driven back out to sea to fend for themselves." By the end of Saturday, 25 dolphins had been removed from their pod and taken "to a lifetime of imprisonment," the group said. One of them died in the process and will be butchered, it said. The dolphins will be kept penned in the cove for another night before the selection process begins again Sunday. The Sea Shepherd Conservation Society live-streamed video of events in the cove Saturday and posted frequent updates on Twitter. "Killers continue to ruthlessly wrap bottlenose dolphins into nets and drag them to the shore for selection," one update said. Another, a few minutes later, said, "Panicked, frightened, and fatigued, another portion of the bottlenose pod is driven closer to the shore." "Killers and trainers tore half of the pod apart today, and will finish tomorrow," was the final post on the day's hunt. Caroline Kennedy, who was sworn in last year as the U.S. ambassador to Japan, tweeted her condemnation of the process. "Deeply concerned by inhumaneness of drive hunt dolphin killing," she said. The U.S. government "opposes drive hunt fisheries." CNN was unable to reach anyone at the town office for Taiji, a community of about 3,000 that juts into the Pacific Ocean, or the local fishermen's union for comment. But local officials have reacted angrily in the past to Western criticism of what they say is a traditional practice dating back centuries. A 2009 Oscar-nominated documentary film, "The Cove," brought the issue of dolphin hunting in Taiji to the fore with bloody scenes of dolphin slaughter. The Wakayama Prefecture, where Taiji is, condemned the film in an online response as distorted, biased and unfair to the fishermen. "The Taiji dolphin fishery has been a target of repeated psychological harassment and interference by aggressive foreign animal protection organizations," it said. "Taiji dolphin fishermen are just conducting a legal fishing activity in their traditional way in full accordance with regulations and rules under the supervision of both the national and the prefectural governments. 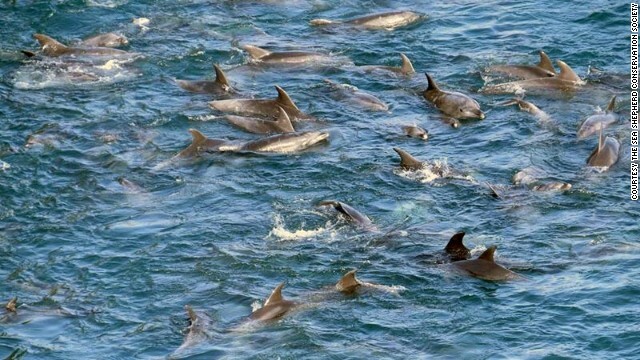 Therefore, we believe there are no reasons to criticize the Taiji dolphin fishery." The Japanese practice of whale hunting has also put it in conflict with the views of much of the world. Japan's fleet carries out an annual whale hunt despite a worldwide moratorium, taking advantage of a loophole in the law that permits the killing of the mammals for scientific research. Whale meat is commonly available for consumption in Japan.